Aanmani Rose is in close proximity to the Brooklyn Shopping Centre, a wide variety of restaurants, Loftus Versfeld Rugby Stadium, the Austen Roberts Bird Sanctuary and the Pretoria Country Club and Golf Estate. Our exclusive conference room is equipped with the latest technology and can seat 14 people. 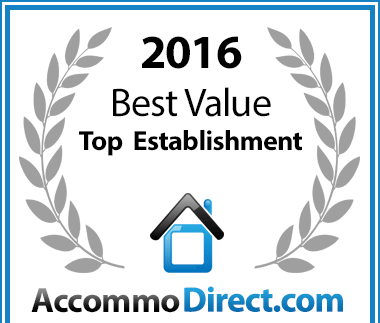 The spacious rooms all have air conditioning for all year comfort, Plasma T.V. with full Dstv, mini-bar and queen size beds. We use the finest linen to ensure a comfortable and peaceful sleep. 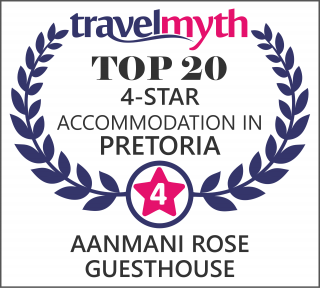 The Aanmani Rose Guest House is situated in the beautiful and leafy suburb of Brooklyn Pretoria. It is a multi-purpose guest house, within close proximity of Pretoria City centre, most international embassies, Loftus Stadium, University of Pretoria, UNISA and Brooklyn Mall. For the ultimate in gracious living and tranquillity, Aanmani Rose will offer you a unique living experience. Accommodation comprises 18 rooms, 6 of which are Presidential Self-catering Units, 7 Mini Self-catering Units & 5 Standard Rooms. The spacious rooms all have air-conditioning for year-round comfort, Plasma TV with DStv channels and a mini bar. The luxury rooms have queen-size beds, made up with the finest linen to ensure a comfortable and peaceful sleep, whilst the deluxe presidential rooms have king-size poster beds and a kitchen. This spacious, air-conditioned room features a balcony with views of the pool and garden. It is fitted with a flat-screen satellite TV, minibar, hairdryer and safe. Plus small kitchenette with microwave, crockery and cutlery. Plus full kitchen and lounge. Our 18 en-suite rooms offer you elegance, comfort and privacy. Relax next to our sparkling pool overlooking the lush gardens. We will cater to your every need.